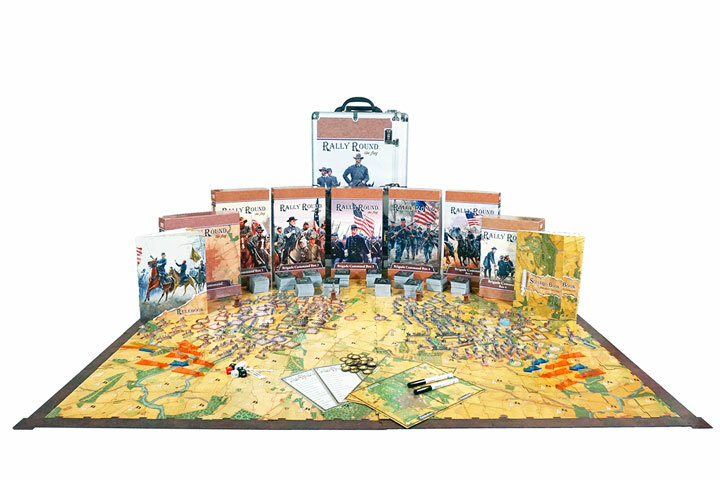 Rally Round the Flag® utilizes three different scales to experience the Battle of Gettysburg. Each of the scales allows the players to fight the battle in varying degrees of tactical and operational flexibility. The different scales allow the players to play games in as little as 2-3 hours or can be expanded to allow greater tactical control and play monster games that could take 20-60 hours to play. Each scale also changes the size of the units under the player's control, from maneuvering entire Divisions in Corps Command, to managing various Brigades in Division Command or taking tactical control of the battlefield in Brigade Command and playing with Regiments. 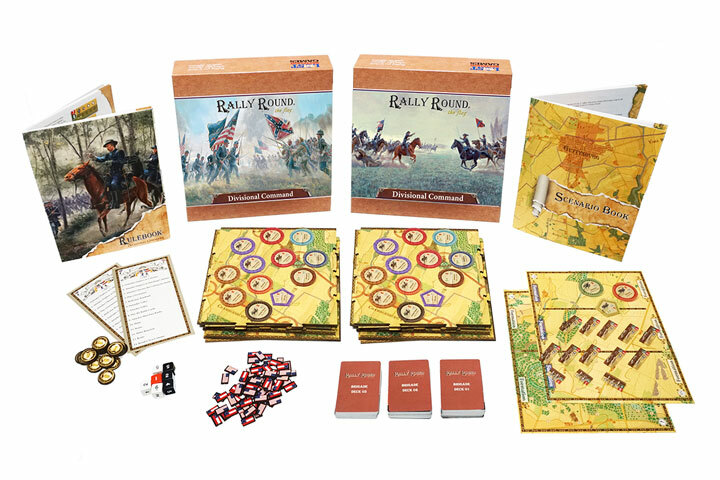 Rally Round the Flag® - Corps Command, a 2 player game, is fought with each stand representing a Division of troops under the command of the Army and Corps Leaders of each Army. The battle is fought on a 28”x22” map of the area around the town of Gettysburg. Each day of the battle is broken into three turns; Morning, Afternoon, and Evening. Each turn has both players alternately activating their Army and Corps Leaders to move, fire and/or attack with their troops. The play time for Corps Command is 2-3 hours for the entire battle of Gettysburg. Rally Round the Flag® - Division Command, a 2-4 player game, is fought with each stand representing a Brigade of troops under the command of the Army, Corps and Division Leaders of each Army. The battle is fought on a 34”x34” map (often referred to in the system as the Grand Tactical Map) of the area around the town of Gettysburg. Each day of the battle is broken into four turns; Morning, Noon, Afternoon, and Evening. Each turn has both players alternately activating their Army, Corps and/or Division Leaders to move, fire and attack with their troops. The play time for Division Command is 8-12 hours for the entire battle of Gettysburg. 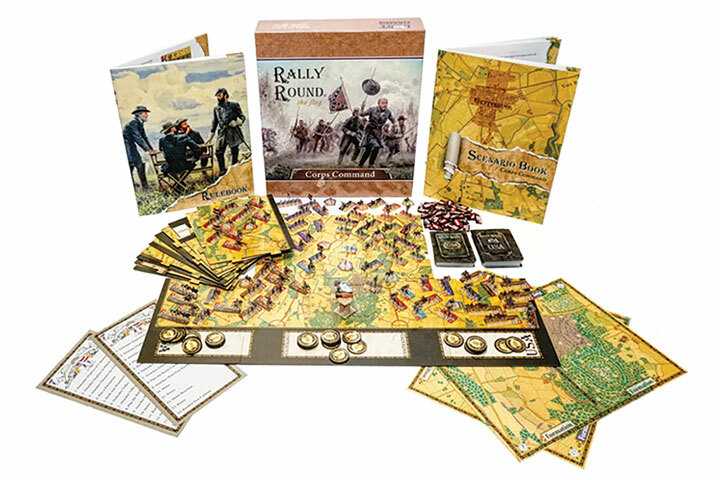 Rally Round the Flag® - Brigade Command, a 2-8 player game, is fought with each stand representing a Regiment of troops under the command of the Army, Corps, Division and Brigade Leaders of each Army. The battle is fought on all or a portion of a 64”x64” map (often referred to in the system as the Tactical Map) of the area around the town of Gettysburg. The Brigade Command Campaign system is fought using Division Command (included with purchase) for operational moves throughout the turn and using portions of the Tactical map to resolve battles tactically. Alternatively, Brigade Command can be played exclusively on the Tactical map without using Division Command as a Campaign Manager.